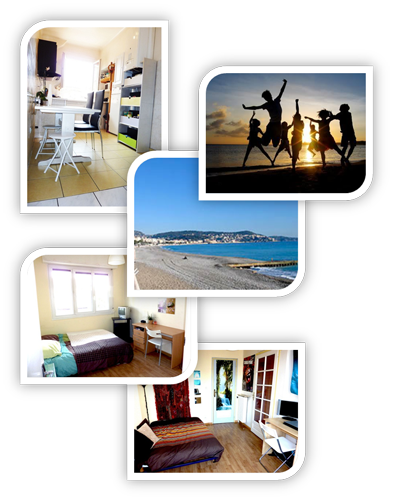 rent room in Nice (france) for students close to center, university , sea, edhec, promenade des Anglais. located "avenue de la californie", this beautiful south facing apartment offers a comfortable living environment ideal for any student or young professional. Beach and shops are within 50m, and the bus stop just outside the apartment allows you to reach quickly and easily all areas of Nice, but also, Sophia Antipolis, Cannes, Antibes and Saint Laurent. TV, internet(fiber!) and double bed in each room. the EDHEC school and the train station "gare saint augustin" in 10 min walk. in 10 min: the neighborhood of "magnan" and therefore, the universities of "lettres" , "droit" and "psychology". in 15 min : the main train station of Nice, the center of Nice and the famous old town. mirrors, big photo frames fot you to be able to decorate your room as you like. Roommates are generally aged between 19 and 27 years old. most of the time , they are europen students who come to spend a year of schooling in france. please, feel free to contact me if you want some information about the people sharing the flat. 1 months stay minimum. i request a photocopy of your ID and a rental insurance. if you are a student , a parental guarantee may be required.